© 2002, © 2018 by Paul Freeman. Revised 9/21/18. 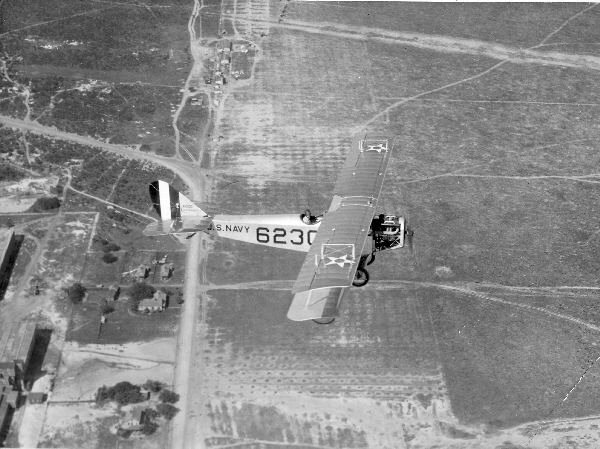 A 1926 aerial view of a JN-4 over Corry Field. 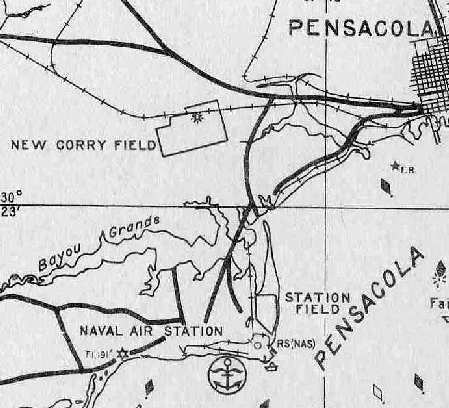 Corry Field was the first auxiliary field established by the Navy to support flight training operations at the Pensacola Flight School. 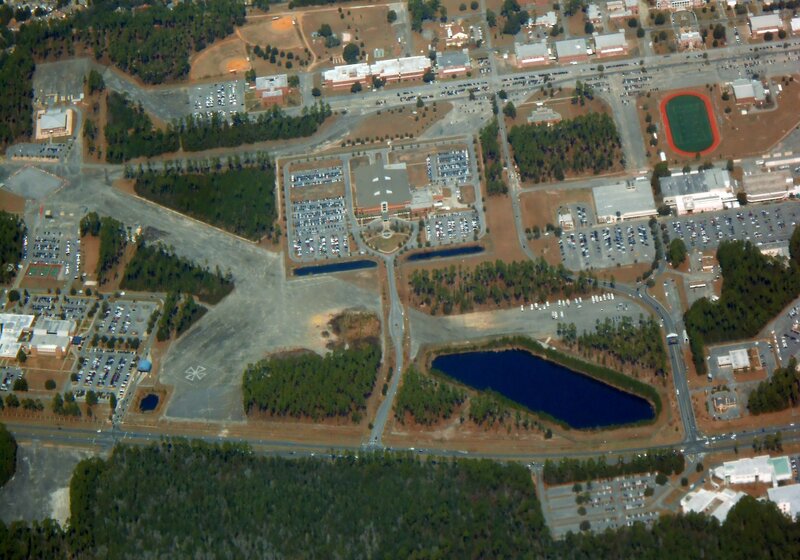 Navy planners sought an additional practice field to accommodate increased training activity. 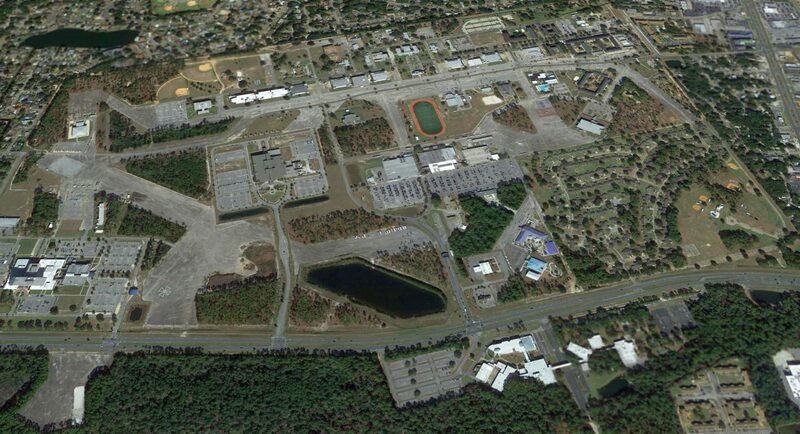 Pensacola city officials offered a 250-acre site north of Pensacola for the new field. In 1922, the site was obtained from the Escambia County Commission on a no-cost, 5-year lease. who was posthumously awarded the Medal of Honor for his attempt to rescue a fellow crew member from a burning aircraft. Training began at Corry Field on 7/1/1922. The field was sandy & facilities were primitive. and a bootlegger had set up a still nearby to supply the aviators with liquid refreshment. Eventually temporary facilities, including a small barracks, mess hall and garage, were built. with a control tower on the northwest side & a hangar on the east side. replaced in late 1927 by the Consolidated NY-1. 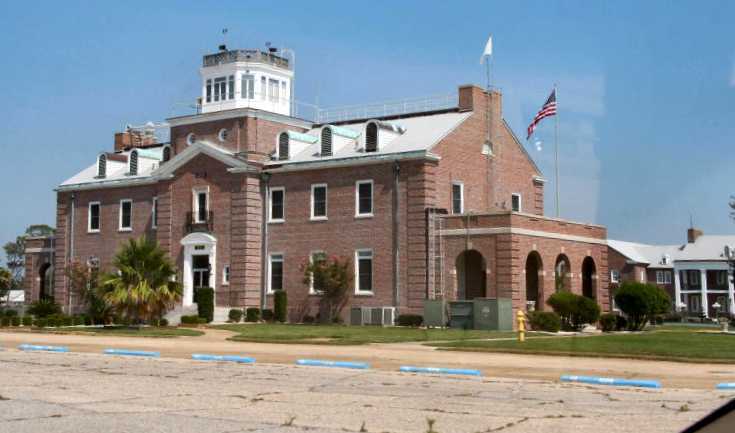 and a new & larger site, located 3 miles north of NAS Pensacola, was presented to the Navy by the County Commission. and the older field became an outlying field (OLF) known as Old Corry Field. as well as New Corry Field (west of downtown Pensacola). Old Corry Field was no longer depicted on the August 1935 Mobile Sectional Chart. 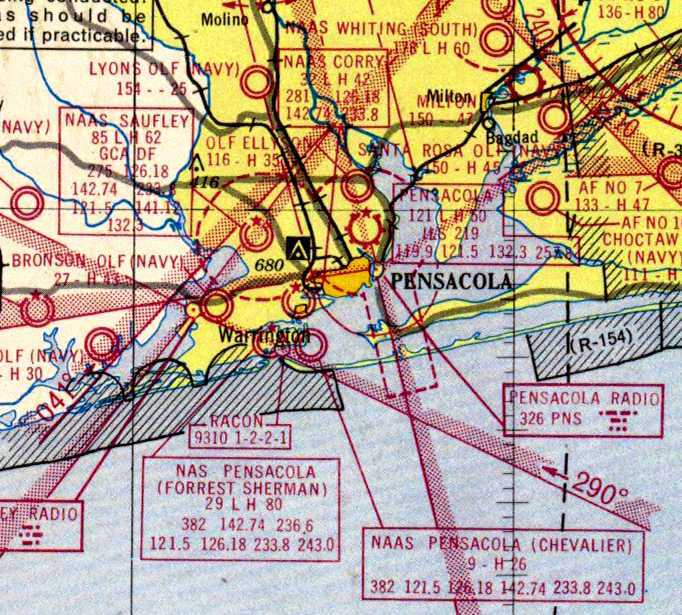 "City Field" was still depicted on a 1939 map of NAS Pensacola & its satellite fields (courtesy of Brian Rehwinkel). a road (present-day Davis Highway) cuts through the middle of the field. Apparently the Navy was still using this OLF because there appear to be 2 planes in the eastern portion of the field (near the white circle)." 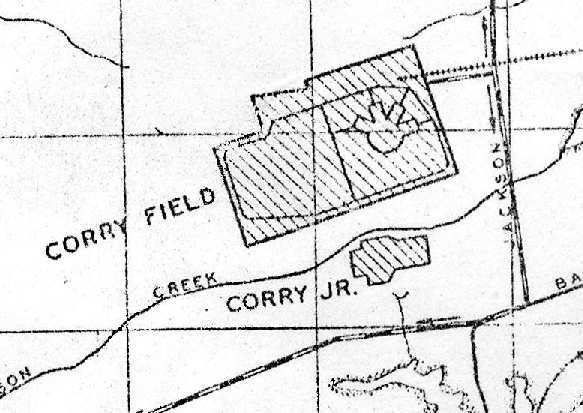 The outline of Old Corry Field was still labled as a U.S. 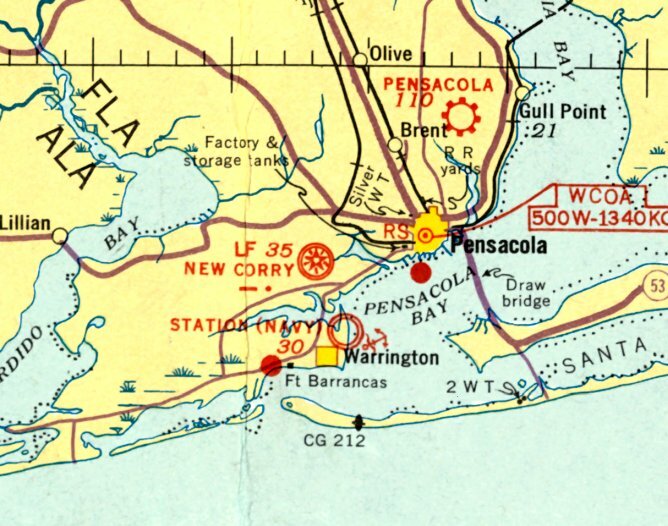 Naval Reservation on the 1941 USGS topo map. But Old Corry Field was no longer listed among active airfields in the 1945 AAF Airfield Directory (courtesy of Scott Murdock). "A sub-division has already been built on a portion of the field." which has been annotated by Brian Rehwinkel to show present-day landmarks. but there are still landmarks that will help identify the site from the air. The western edge of the field was the railroad tracks on the left side of the photo. 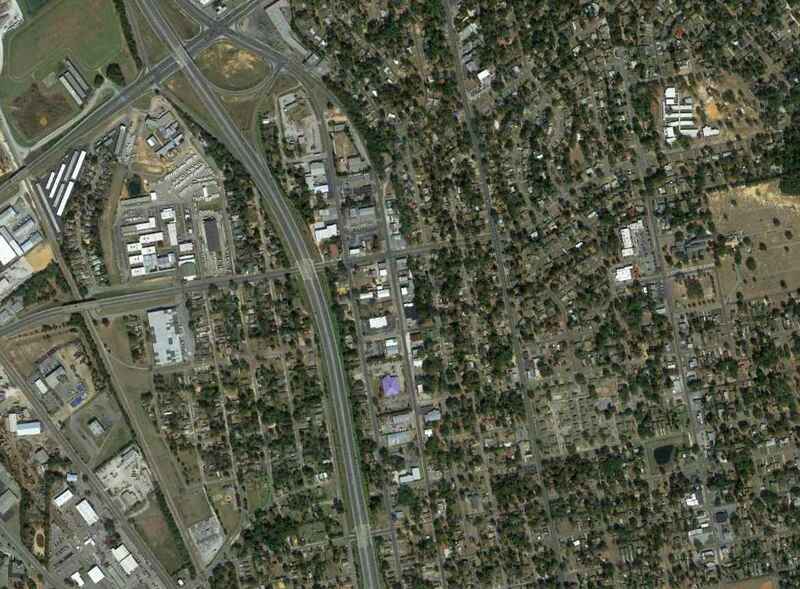 The northern portion of the field is where the interchange for Interstate 110 is now located (at the top of the photo). The eastern edge of the field was where today's 9th Avenue is located. (the curved road that went through the middle of the field). 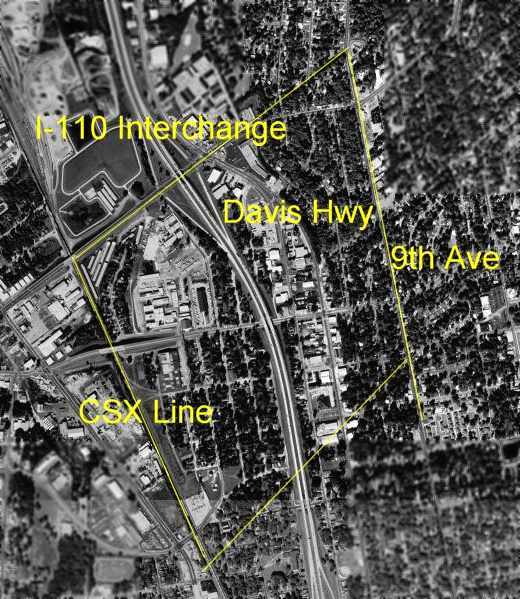 Today, Davis has been divided (north & south) at the point it used to go through City Field. auxiliary training fields for the U.S. Navy!" A 2015 aerial photo of the site of City Field. 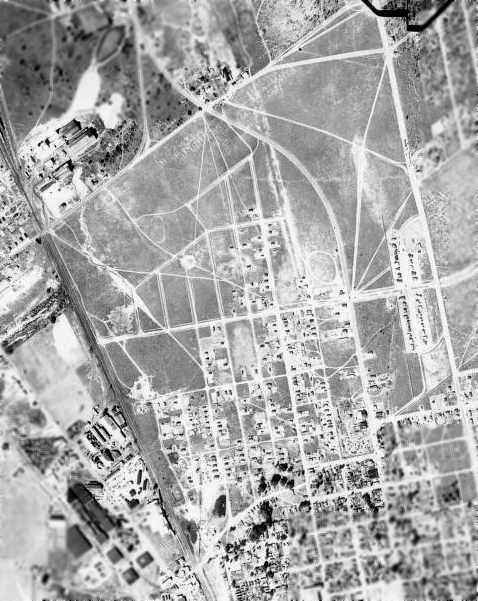 A circa 1920s aerial view looking north at Corry Field. which had become too small to adequately support Navy flight training operations. 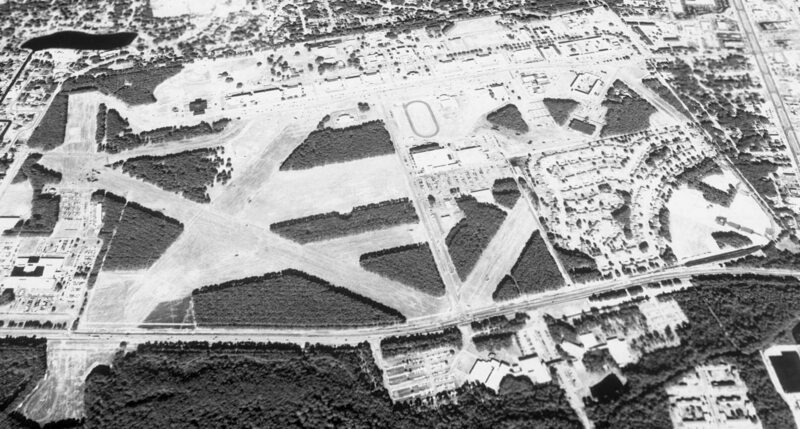 The new Corry Field, though initially unpaved, boasted a galley, three large barracks and a temporary hangar. A fence at the new field kept the cows from wandering about during flight operations. the facility became the home of Training Squadron 2 (primary landplanes) and Training Squadron 5 (fighting planes) for the next 14 years. “Used between 1927-34 to light the southern edge of the landing field that was only a grass area at the time (i.e. no runways). The lights had electrical & a gas system for added light augmentation as needed. 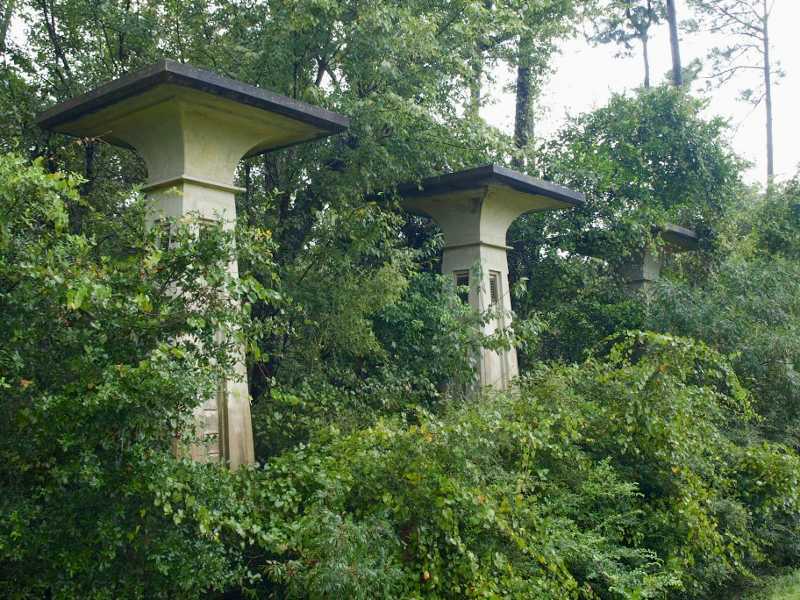 The pillars were 15-20' tall & each held a 7' tall light. Two additional sets of shorter pillars were located along the western & northern field boundaries. These lights permitted safe clearance of trees & lit the landing areas for the early biplanes (without any onboard lights). 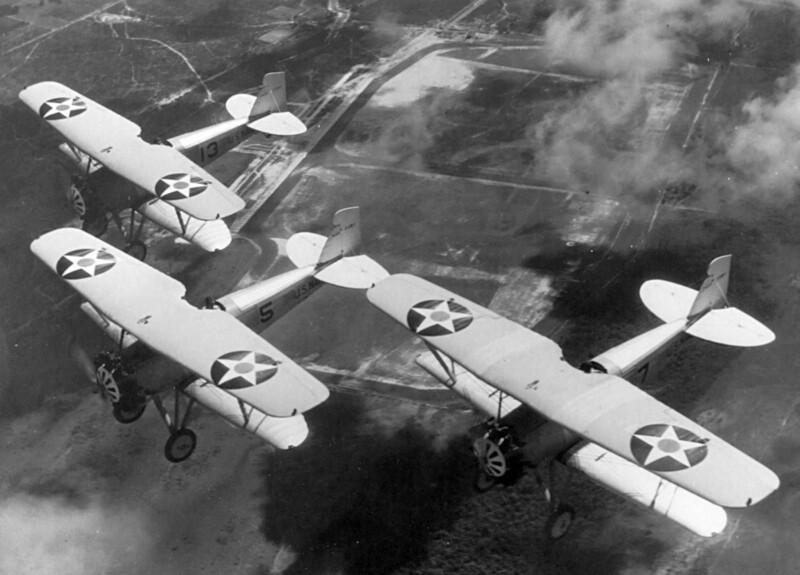 A circa 1928-30 aerial view (from the National Museum of Naval Aviation) of 3 Boeing F2B-1 fighters overflying Corry Field. 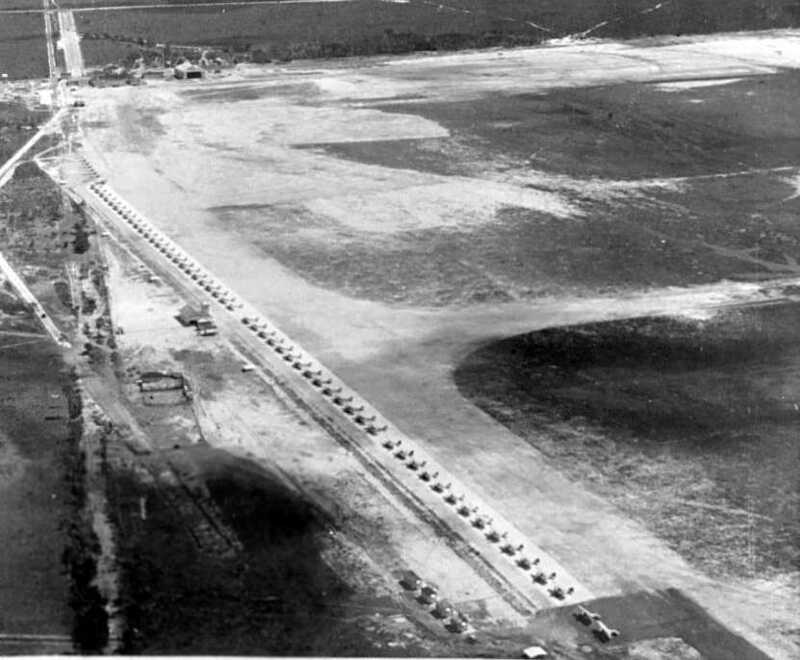 An undated (possibly 9/27/30) aerial view looking west at a long row of trainers lined up on Corry Field. whose design became a model for hangars at all future Pensacola auxiliary fields. it was paved & taxiways were incorporated into the growing airfield layout as the tail-skid trainers were replaced by those with brakes & tail wheels. 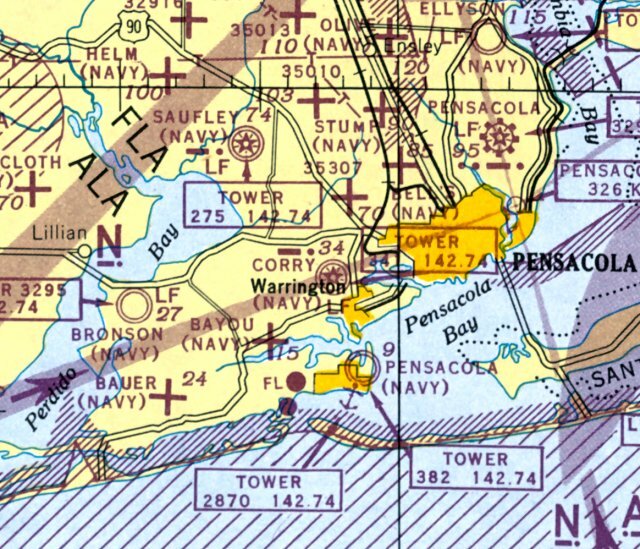 "Corry" Field, as depicted west of Pensacola on the 1934 Navy Aviation Chart V-242 (courtesy of Chris Kennedy). The location of "New Corry Field", as depicted on the 1934 Navy Aviation Chart V-242 (courtesy of Chris Kennedy). "New Corry Field" was described as consisting of a 6,243' x 3,970' sandy loam field. 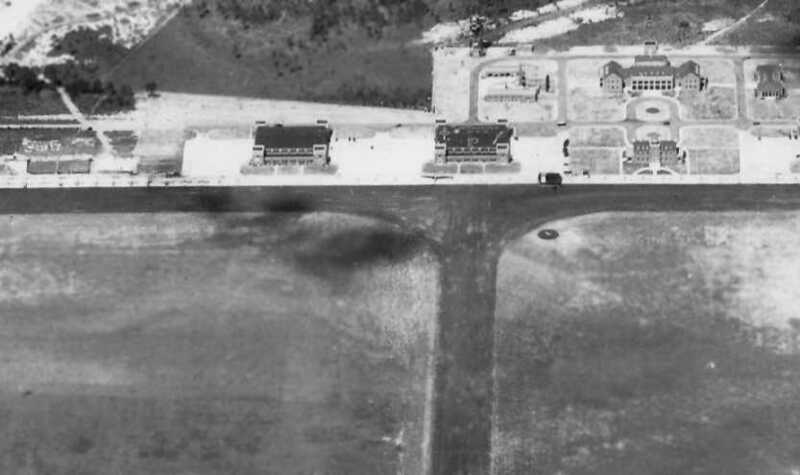 A 10/2/34 U.S. Navy aerial view looking north at Corry Field (courtesy of Brian Rehwinkel). Brian observed, “This photo shows Corry field after the hangars & other structures were completed. You can see that by this time the field’s basic layout was complete. showing the small number of planes present in the picture. Corry Field was officially dedicated by Rear Admiral Ernest King on 12/8/34. A mass formation flight accompanied the dedication ceremonies. looking east along an amazing lineup of biplanes at Corry Field. In the pre-World War II era, Corry consisted of 2 separate fields: East & West. a bewildering mixture of primary & fighting planes landing & taking off at the same time. It was also home to primary elimination glider training in the mid-1930s. 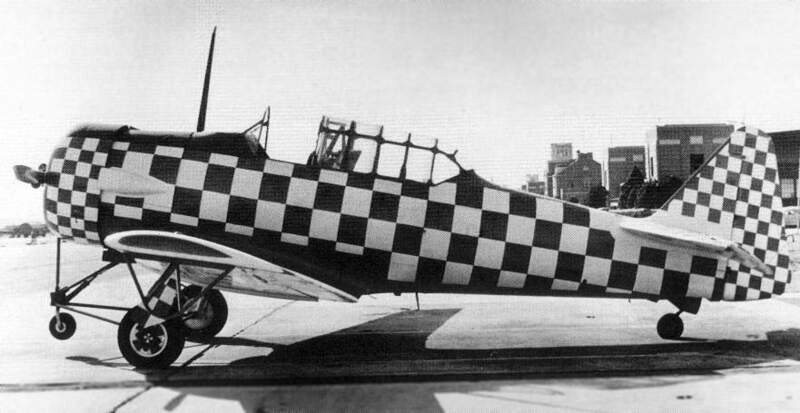 Primary squadrons flew the reliable NY-1 until replaced by the NAF N3N, the Stearman NS and later the N2S beginning in 1935.
as well as the Vought O3U & SU & the North American NJ in the 1930s. The August 1935 Mobile Sectional Chart depicted "New Corry" Field. 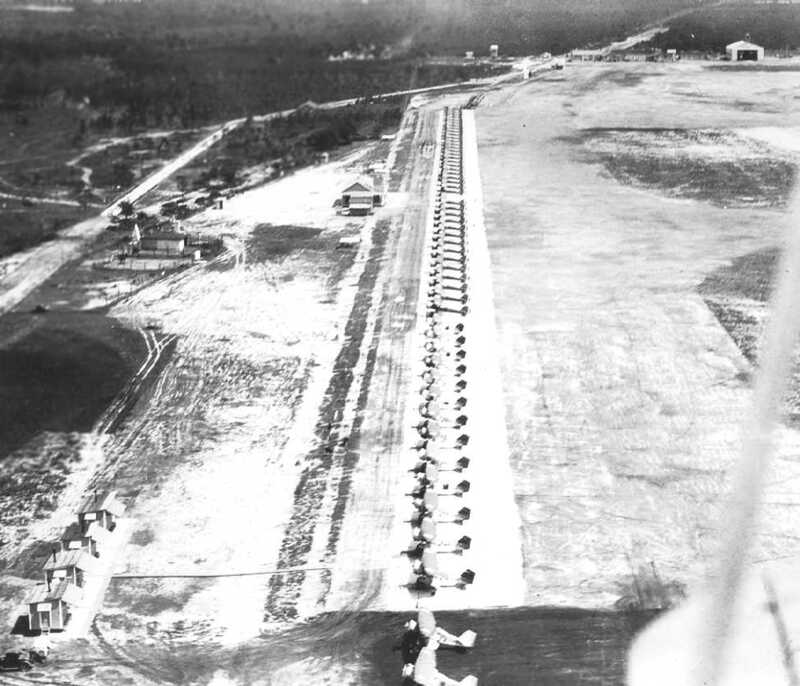 A 1938 view of N3Ns, SNJs, and other aircraft on the Corry Field ramp. 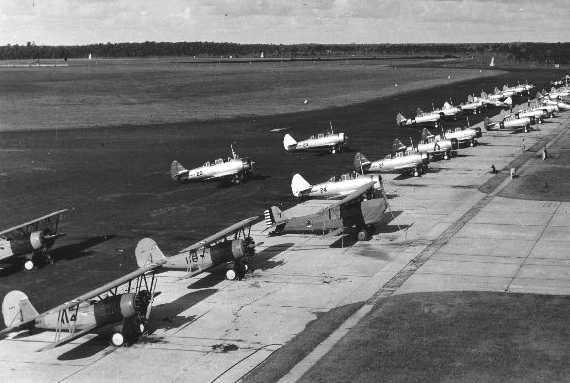 A circa 1938 photo (from the National Museum of Naval Aviation) of N3N-1 trainers of Training Squadron 2 at Corry Field. depicting both Corry Field & "Corry Jr", a smaller field adjacent to the south side of Corry Field. As the winds of war stirred in 1940, the entire training syllabus was modified to meet expanded training needs. 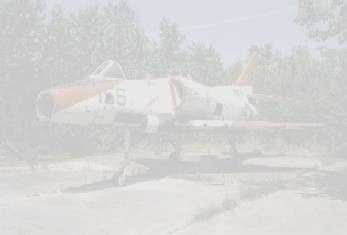 to be replaced at Corry by an additional primary training squadron, VN-1B. Primary training in hundreds of yellow N3Ns & N2Ns was conducted at Corry by VN-1A & VN-1B until late 1942. The “Yellow Perils” were also used by the Primary Instructor School, based at Corry until early 1943. The field was designated a Naval Auxiliary Air Station on 15 January 1943. During WW2, Corry had an outlying field, Pensacola Field #8, at Muscogee, AL. No trace remains of this outlying field. In 1942 the NAS Pensacola Transport Unit, flying PBYs, R4Ds and SNBs, found a home at Corry. and conducted multi-engine patrol or VB-2 training in SNBs until moving in November 1943 to Whiting Field. conducting carrier aircraft VTB (torpedo/bombing) training initially in land-based OS2Us (and later SNJs) until the end of 1944. VB-2 training returned to Corry at the end of 1944 & remained there until mid-1947, operating at times more than 160 SNBs. A utility squadron flying PBYs was also based at Corry for towing targets, patrolling and air-sea rescue. 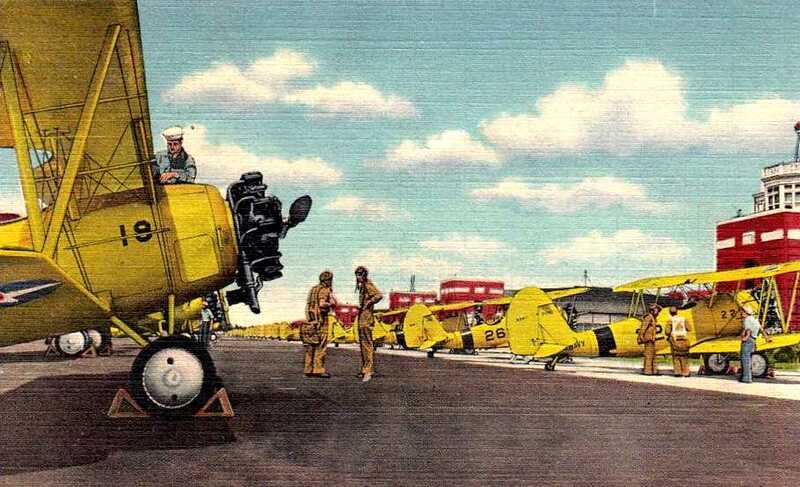 A WW2-era colorized postcard photo of Navy biplane trainers at Corry Field. The 1944 USGS topo map depicted Corry Field as two open areas, lacking individual runways. Two labels indicated “Corry Field 1934”, an apparent indication that the depicted configuration was 10 years out of date. 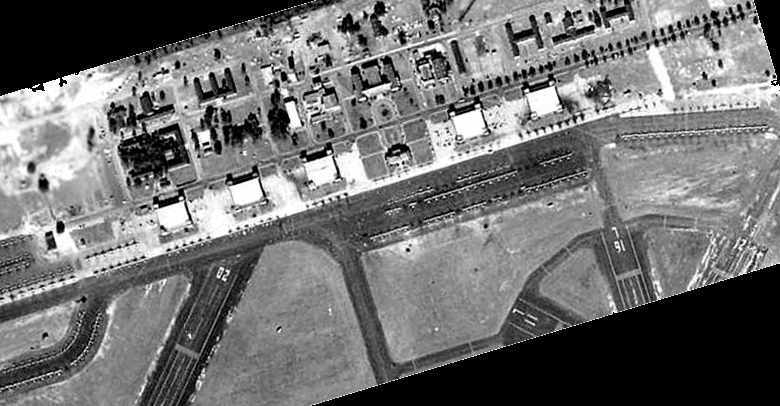 A WW2-era National Archives aerial view of Corry Field. 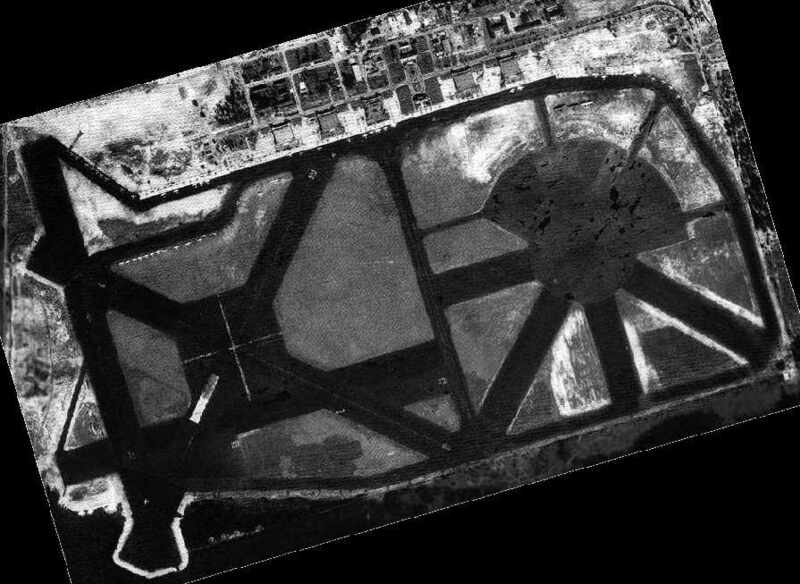 This small complex had an extremely dense runway layout, with at 8 paved runways in 2 adjacent intersecting groups. The longest runway was 4,500'. 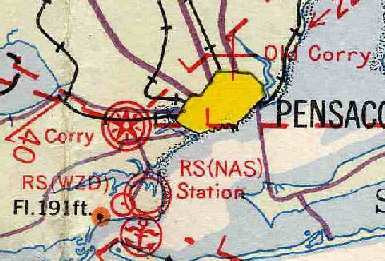 "Corry (Navy)", as depicted on the July 1945 Mobile Sectional Chart. By the end of WW2, Corry Field provided the basic instrument portion of primary flight training. 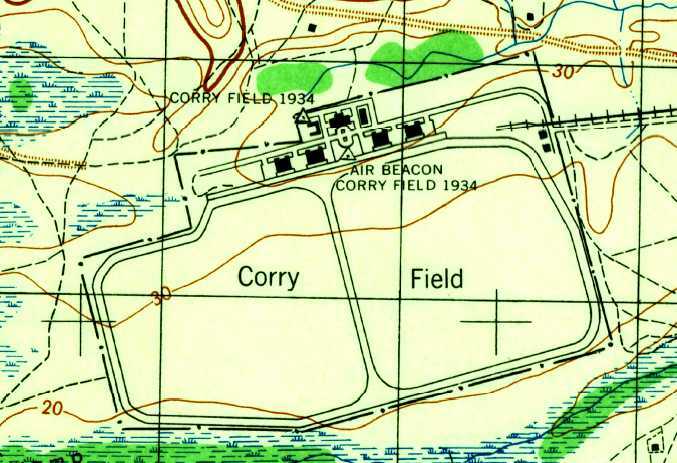 Corry Field was decommissioned as a NAAS at the end of WW2, but remained an active training field. all basic training in SNJs was concentrated in Pensacola when advanced training moved to Corpus Christi. and then various types of basic flight training that included instruments, night flying and VS/VP basic in SNJs and later T-28s and SNBs. The field was also home from mid-1949 until mid-1952 to the Basic & Advanced Training Command’s carrier qualification training unit. Allan Edwards recalled, “I was a USN Tradesman stationed at Corry from early 1954 to 1956 as a Link Trainer Instructor & maintenance man. 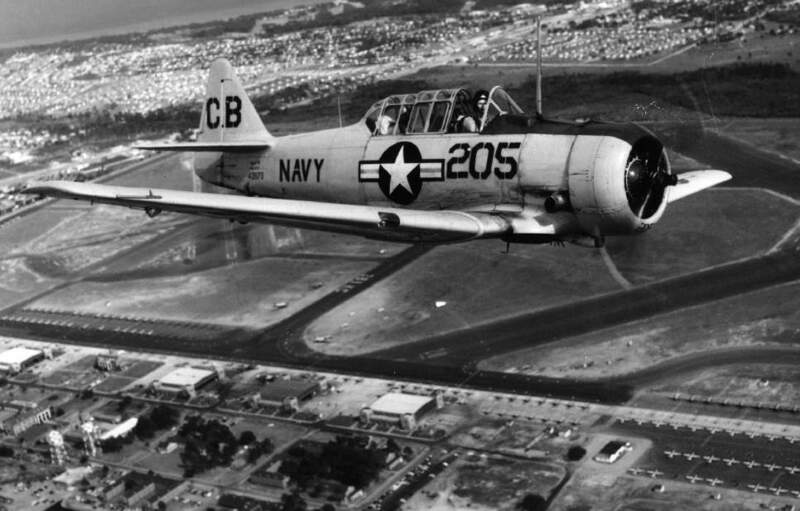 A 1955 USN photo of an SNJ Texan over Corry Field (courtesy of John Voss). A 1955 USN photo of newly arrived T-28B Trojans at Corry Field, with SNJ Texans behind them (courtesy of John Voss). with a temporary nosewheel intended to prevent prop strikes by students (National Archives photo). (among a dizzying array of Pensacola-area airfields) as having a 4,200' paved runway. but the ramps were still filled with over 100 aircraft. A 1958 photo of a North American T-28B Trojan (& a beautiful 1953-54 Chevrolet Bel Air convertible) at Corry Field. 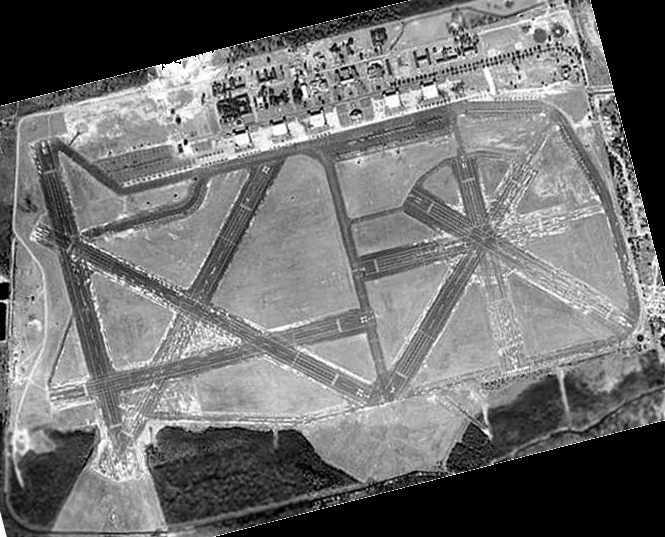 Corry Field was closed as an airfield in June 1958. 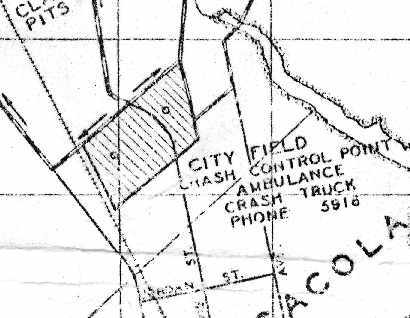 Corry Field was depicted as “Abandoned airport” on the March 1960 Mobile Sectional Chart. when the hangars & station buildings were converted to classrooms for the newly arrived Communications Technician school. A 1963-64 photo (courtesy of Dallam Oliver-Lee) of a drag race held on a Corry Field runway. across the southwest end of the runways at some point between 1958-65. 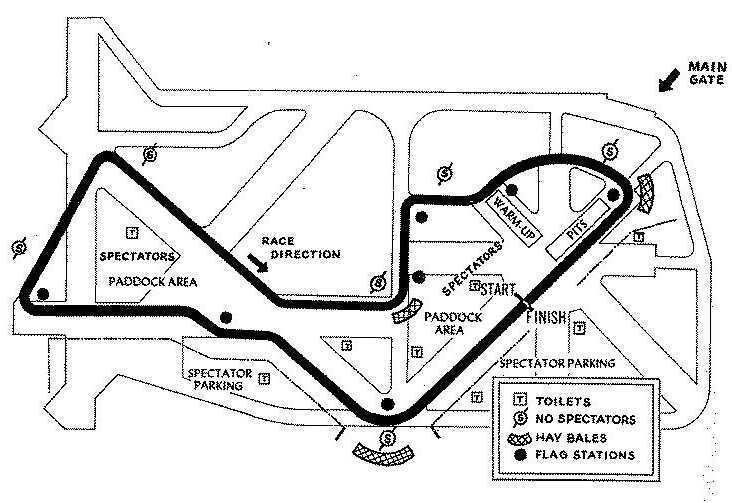 A 1965 map (courtesy of Dallam Oliver-Lee) of an automobile race course laid out on the Corry Field runways. An undated (circa 1960s-70s?) photo (courtesy of Dallam Oliver-Lee) of a “Corry Field Landing Field Floodlight”. 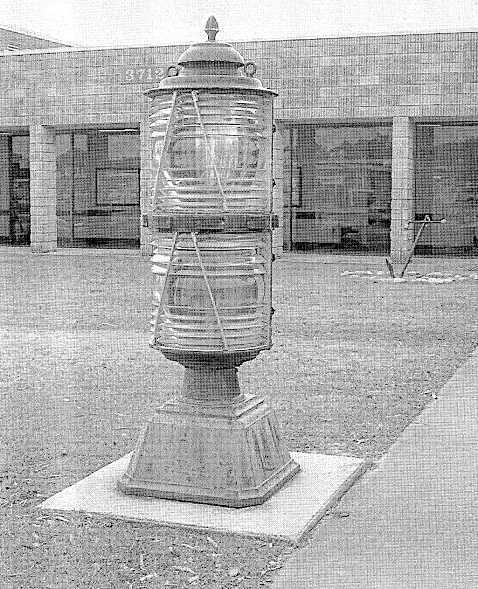 This is the type of light which was mounted on the pillars pictured in the 2013 photo several paragraphs below. 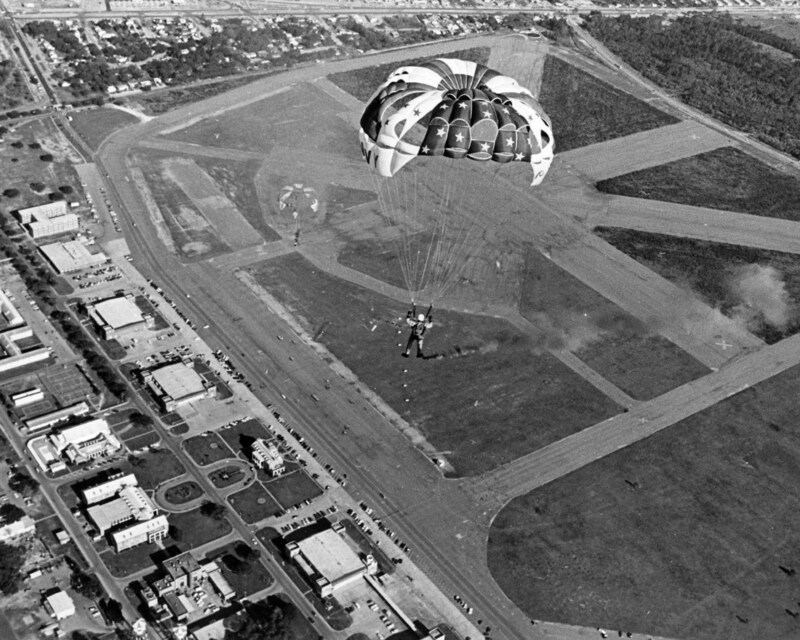 A 1970 aerial view looking east at the Navy Chuting Starts parachuting team making a practice jump over Corry Field. 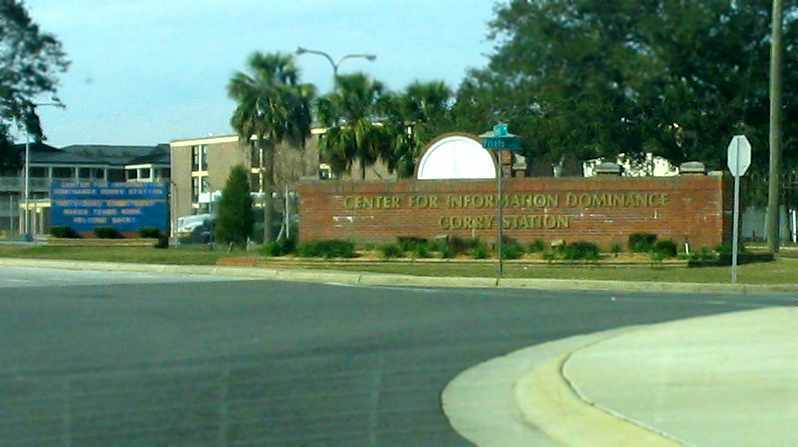 In 1973, the installation's name was changed to Naval Technical Training Center, Corry Station. specializing in cryptology, electronic warfare, advanced calibration, information technology & instructor training. 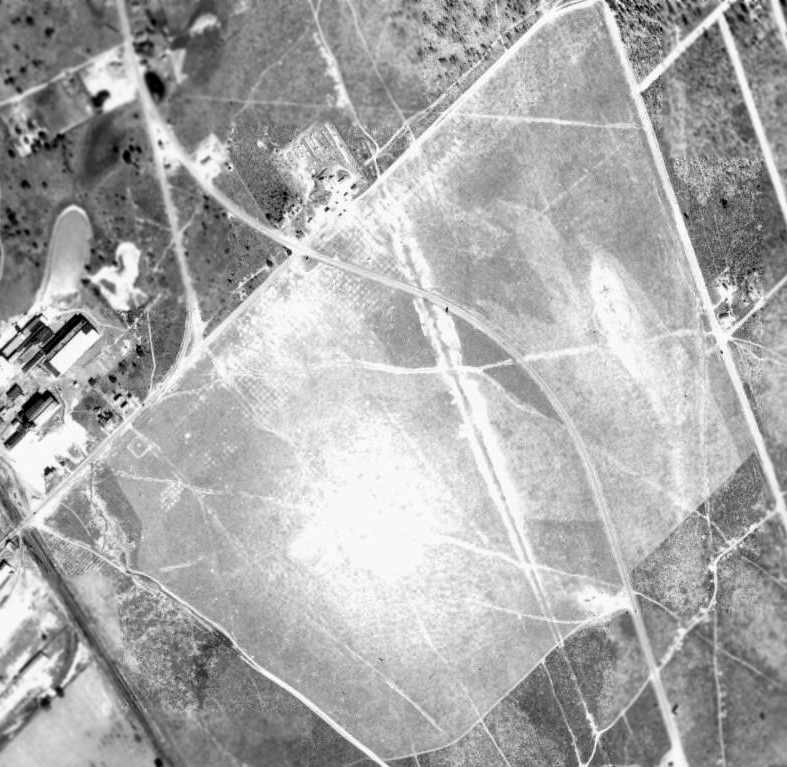 over the western & eastern portions of the airfield at some point between 1965-79. 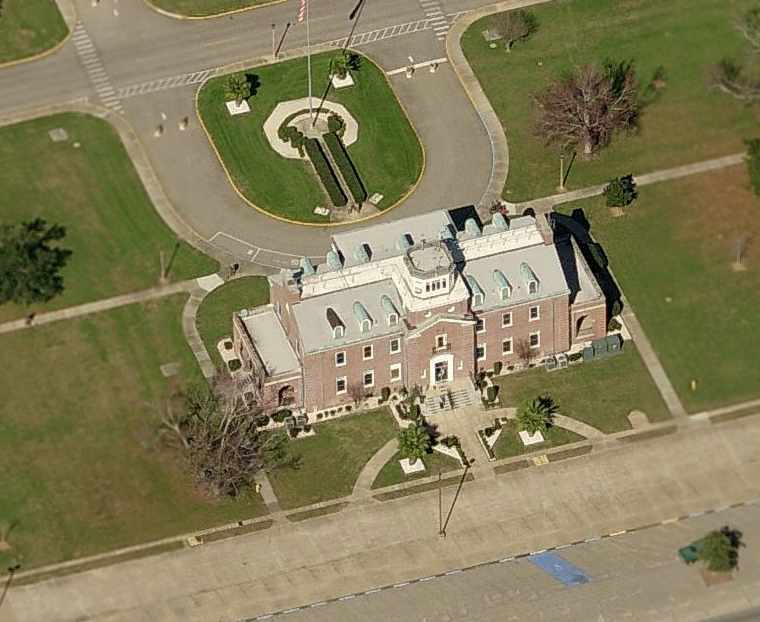 A 1994 USGS aerial view looking north at the site of Corry Field shows the northeastern portion reused as the Naval Technical Training Center, Corry Station. The hangars & other buildings were still in use, although in a highly modified form. while the southeast portion had become the site of the Navy Exchange shopping Mall. which now occupies the northeastern portion of the former airfield. which is still used as a helipad for the adjacent Naval Hospital (note the windsock). A June 2006 photo looking northwest at Corry Field's former operations building & control tower. 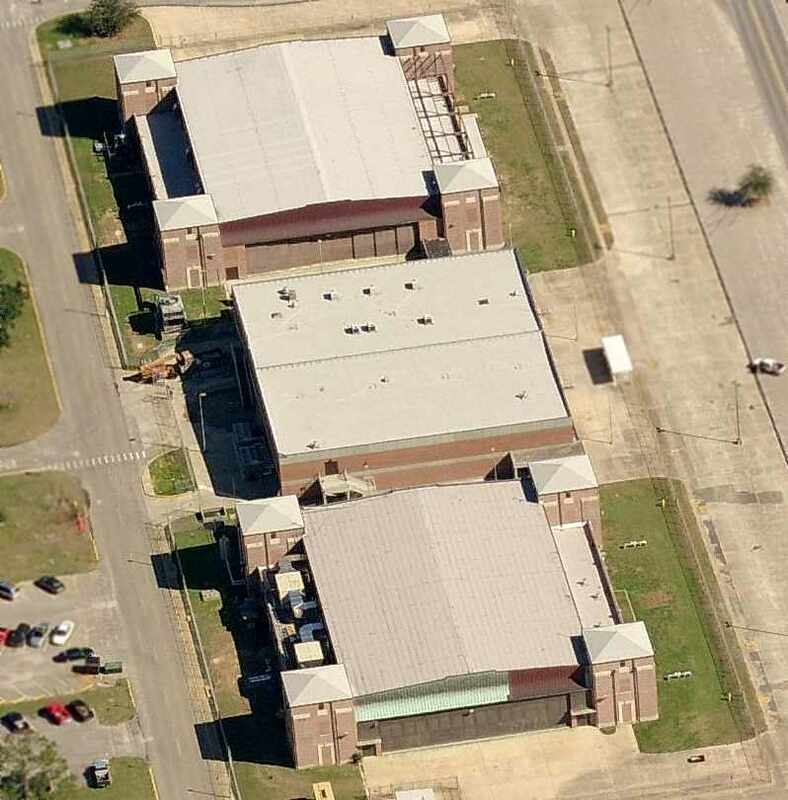 A circa 2006-2007 aerial view looking north at the former operations building & control tower at Corry Field. with a modern building in between them (which was evidently added at some point between 1958-99). south of the intersection of Route 98 & Veteran's Way. (as confirmed by the NAS Pensacola library, several paragraphs above). A 2017 aerial view looking north shows a significant portions of at least 8 Corry Field runways are still intact. A 1/25/18 aerial view by Alex Price looking north shows a significant portions of at least 8 Corry Field runways are still intact.